You can’t have Halloween without plastic spiders or the plastic spider rings, at least not in our house. The kids always request those and vampire fangs. Last year the kids enjoyed a fine motor threading activity using our plastic spider rings that I set up, so I turned to one my of favorite places (Pinterest) for more fun filled spider activities. 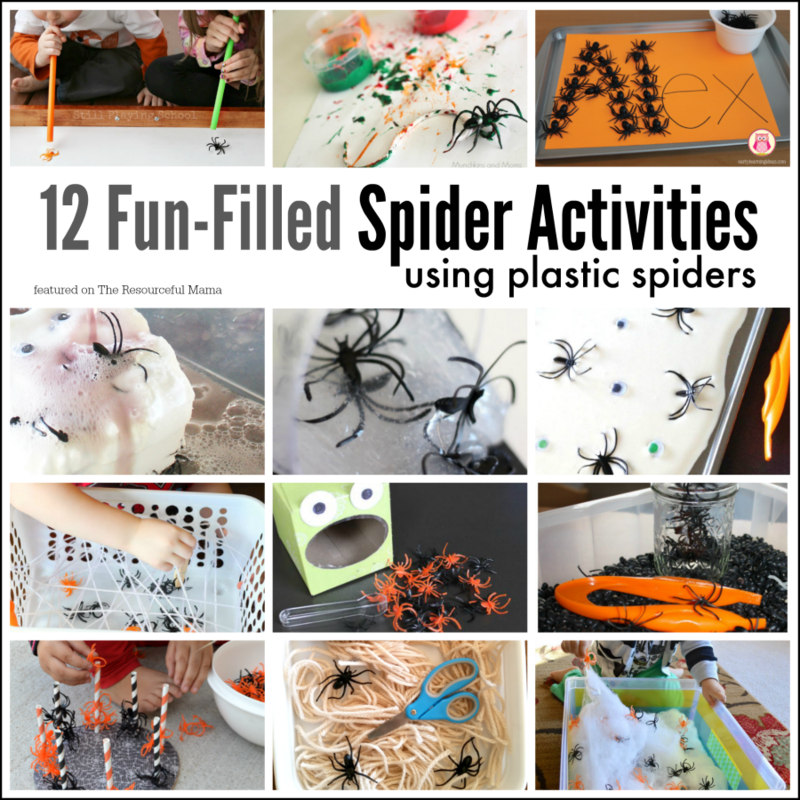 Not only are these spider activities lots of fun, but they also offer kids the opportunity to explore science and math, build motor skills, and more. 1. Get competitive with these spider races from Still Playing School while building oral motor skills. 2. Spider web painting from Munchkins and Moms is a fun process art activity for kids. 3. Early Learning Ideas turns plastic spiders into magnetic spiders for fun spider learning activities. 4. Pre K Pages’s frozen fizzing spider science experiment is a fun hands on kitchen science activity for kids. 5. Little Bins for Little Hands made spider web slime using plastic spiders. 6. Oobleck is an fun and unique substance in that it is a liquid and solid all in one. Little Bins for Little Hands took the fun up a notch with spider oobleck. 7. This spider web activity from Mom Inspired Life is a fun fine motor activity. 8. Work on counting, sorting, and fine motor skills while feeding the frog from Kiwi Crate. 9. Build fine motor and math skills using gator grabber tweezers in this spider sensory bin from Little Bins for Little Hands. 10. This spider treading activity from The Resourceful Mama is another great fine motor and early math activity. 11. This Very Busy Spider Cutting Activity encourages kids to work on scissor skills while enjoying a popular Eric Carle book. 12. This spider web sensory bin from Minnie Mama comes together super fast and offers tons of fun.